Orthodox Rabbis representing Torah-True Jews and Rabbinical authorities will be demonstrating their outrage at the Zionist state of "Israel" and its atrocities against the inhabitants of Gaza. What has caused a people to fall to such levels of depravity? Come and hear our message! Zionism and the state of "Israel" is expressly forbidden according to the Torah. We are forbidden to make any attempts to leave the Godly decreed exile; We are forbidden to oppress any people and we are required to be loyal citizens in every country in which we reside, we are required to emulate God — we are to be kind and compassionate. Judaism is a religion of thousands of years. Zionism is a relatively new movement of over little over a hundred years, created by non-religious Jews who aspired to transform the religion into nationalism and have rebelled continually against the Almighty's commandments. This has culminated in the terrible atrocities being perpetrated against the people of Gaza today. Jews true to the Almighty and His Torah cry out. Hear our voices at the protest that will take place Sunday January 4, 2009 at 4pm at the park across from the United Nations in New York City, NY. There will be made available at the demonstration FOR THE FIRST TIME the English compilation of "Historic Documents" which shows the Jewish opposition to Zionism and the Zionist leaders heretical statements and comments. 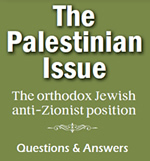 Also, for the first time, the English book, "The Rabbis Speak Out", which is a compilation of the Rabbinical Authorities' most vociferous universal opposition to Zionism. May we be worthy of the speedy and peaceful dismantlement of this rebellion against God and the cessation of the Zionist attacks on Gaza. Protests against the Zionist bombing and invasion of Gaza are being held around the world. As images and reports come in they will be posted on this web site. demonstration in New York City.